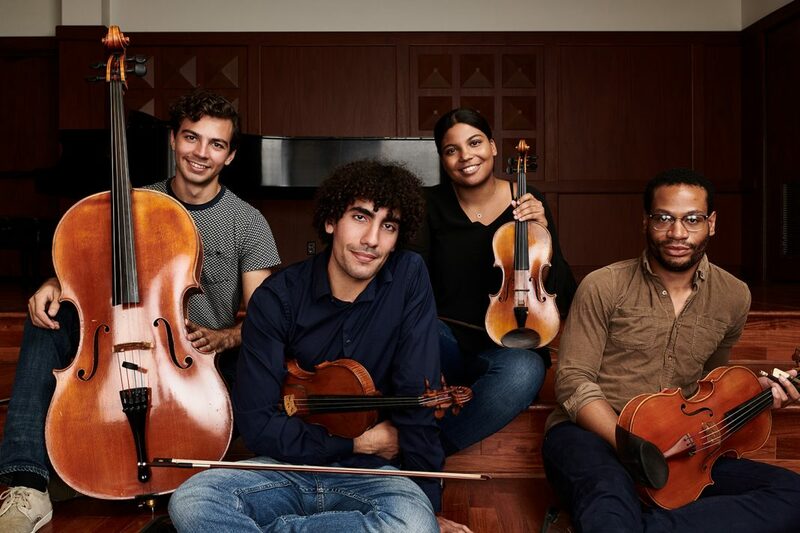 The inaugural class of Los Angeles Orchestra Fellows, left to right: Juan-Salvador Carrasco, cello; Ayrton Pisco, violin; Sydney Adedamola, violin; and Bradley Parrimore, viola. Photographed in MacDonald Hall on the University of Southern California campus. In the 1970s and ’80s, the country’s top orchestras began using blind auditions to select their musicians, hiding the faces and forms of the applicants behind opaque screens. If the musicians were unseen, the thinking went, the juries—almost universally white and male—would be less apt to discriminate against women (who made up only a tiny fraction of orchestra rosters) and African Americans (who had been excluded for decades). The experiment worked—to a point. The number of women in major orchestras skyrocketed from around 5 percent in the 1970s to upward of 30 percent today. But the number of musicians of color didn’t show a comparable rise, largely because a Matterhorn-size mountain of obstacles, from the lack of orchestra programs in underrepresented communities to the high cost of instruments and lessons, kept many potential applicants from picking up a violin or viola in the first place (string players make up two thirds of modern orchestras). In an effort to remedy that situation, three of the city’s powerhouse musical institutions—the Los Angeles Chamber Orchestra, Dickerson’s ICYOLA, and USC’s Thornton School of Music—have come together to create the Los Angeles Orchestra Fellowship. Launched in August, the program selected four fellows who, over the course of two years, will be trained by LACO musicians, perform in concerts throughout the city, instruct aspiring young students at ICYOLA, and pursue a music certificate at USC. The fellowship is the first of its kind in the country to include an institution of color in its creation and development (in this case, ICYOLA, the country’s largest African American-majority youth orchestra) and the first to include a mentoring component. “The mentoring part is so critical because the problem we’re trying to solve is so much larger than four people,” says Scott Harrison, LACO’s executive director. On a recent afternoon I find the four fellows in a small, windowless practice room inside USC’s Ramo Hall talking with Lina Bahn, a violinist and USC music professor who is serving as one of their advisers. The fellows include Bradley Parrimore, a native of Houston and graduate of the Manhattan School of Music, and Sydney Adedamola, who grew up in Boston and recently graduated from USC. Ayrton Pisco, a violinist from Brazil, first played with the Brasilia National Orchestra at the age of five, while Juan-Salvador Carrasco, who was born in Mexico City and grew up in Santa Monica, has performed in orchestras under Placido Domingo and Yo-Yo Ma. The four of them live together in the same graduate dorm building, which makes it easier for them to practice together or just hang out, which they do. In addition to their other fellowship duties, the four were also specifically chosen to perform together as a string quartet. Think of them as the Navy’s Blue Angels, but with violins instead of F/A-18s. The four will also participate in mock auditions, with all the time pressure that those entail—but with the added perk of critiques from professional LACO musicians afterward. All that advice and practice will hopefully help them when real auditions come around, which is, after all, the whole point of this. 9 Great Ways to Spend Your Weekend in L.A.